The sport of Extreme Enduro is growing massively in popularity, and in doing so is creating a whole heap of new specialist young British talent. One of those young riders to come through the ranks is Bath-based Charlie Frost who is to be a feature rider of ours this year. Dirt Hub: So Charlie takes us back the beginning and your racing background? Charlie:I started trials when I was 6 years old. I got into it through my Dad who was interested in motorbikes, and then he got into Enduro’s, and I went along and watched him. I started riding a pushbike age 4 or 5 and we got my first trials bike, a TY80 at the age of 6 and it just sort of snowballed from there really. I did trials until I was about 12-13. I started off as a complete beginner and worked my way up through. I didn’t really get up to National level, I just sort of did Club events and I won one National somewhere. So that was trials which is where I learnt the key basics, clutch control, balance and throttle and stuff. You can see in the Extreme side of things how much a trials background benefits you. That’s where Graham (Jarvis), Jonny (Walker), Billy (Bolt), and Paul Bolton, came from. So I am definitely glad that I started with Trials as the speed element you can pick up quicker than you can the trials skills, whereas with Trials it takes a lot more time to learn. With the speed, cornering and braking are difficult, but I think you can pick it up quicker than you can than the technical stuff. I still do some Trials now, there’s always something on at Christmas time, when there is no racing so I will have a go at a few of them. I started Trials from a very young age and looking back now I am grateful that I did. DH: When did you start to move towards Enduro? Charlie: It was Boxing Day 2006, and I remember opening up the Garage door and there was a Suzuki RM85 on a stand, and that was I think when I was 12 or 13. So from there we just started practising on it. It was obviously a lot bigger than a DT80 Trials bike, so I just had to get used to the weight of it. I had the clutch and throttle control, so I entered my first Youth Enduro when I was 13 at a Track N Trail event down south, then it went from there. I got to the age of about 16 and I did my first Adult race, and I did my first Extreme Race when I was 16 too, again with Track N Trail, they called it Destination Portland. I was 17 when I properly came into the Extreme side of it. I was doing the Carl Tiley Events, the Wor Events, Track N Trail, Mid West when they ran a series. I went to Extreme stuff with Wor Events and the Tough One. That was my first main event. I was on a KTM 125 EXC, and had a little bash at that and did quite well. I think I won the Sportsman class and came about 5th overall so I soon moved up into Clubman. I am very grateful now to have made that jump as with the Timecard, the British Enduro Championships and that, for me personally it’s not my type of going. Its good with the tight time checks and that, but when it’s a slap check and its cold on a Sunday morning, and you get to your check with 10 minutes to spare, you get cold again. Where the Extreme stuff, from the flag drop you are into it for 2 to 3 hours, and its constant hard riding, and it takes a lot of skill and using your head to get yourself out of situations. Especially with the crowds now, they love the Extreme stuff, its so well supported in the UK and especially abroad, and with all of the fans there it’s really good for us. I stick to strictly Extreme stuff now, I don’t mind doing the fast stuff, which can be part of Extreme, but you look at Graham, who is the greatest of all time… when it comes to the faster stuff, he struggles because the fast stuff is not his forte. He is an extreme rider, not a fast rider, whereas you’ve got, Billy (Bolt), Wade (Young), Mario (Roman) and what not, they have got speed as well as technical abilities. It is crucial to have the speed and as well as the technical sort of things. Charlie: Yeah I know a lot of lads now that did the club Hare and Hounds, but they a lot will now stick to Extreme Enduro because they will pay their money, maybe £60, £70, £80 but they are paying for a good race. I have done many events in the past where you turn up on the day, and do a day license, day entry as well as your normal entry fee, so you are paying £70 to do a normal Hare and Hounds riding around the side of a field, and you are thinking, its classed as an Enduro though you are racing around the hedges. I have done so many of them, I just got fed up, whereas with the Extreme you pay your money, but you know you’re going to get value for money. It’s like with Tong for the first round of the British Extreme that was superb. You pay £85 but I would pay all day long to ride around there. Plus you are riding against the Worlds best, plus the UK’s best. I know a lot of lads now who just stick to extreme including myself, again its whatever you enjoy doing, but you know you’re going to get a good event out of it. You know you’re not going to travel 3 and half hours and ride around the edge of a field and think that was a waste of money. Plus there’s the Diesel for the van. Myself and my Dad are up and down the country every weekend, so that’s a £100’s worth of diesel each time, just in the van itself, so you want to make sure what you are doing is worth the journey and the money. It’s definitely good to be doing Extreme Enduro now, as its so well supported which makes it worth all of the effort you put in! DH: You seem to have been really busy this year already? 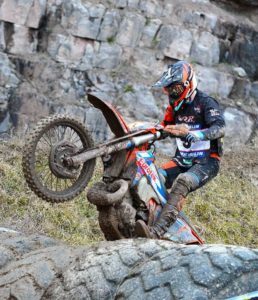 Charlie: Yeah January is always busy for us, as you have the beginning of the British Extreme Enduro Championships, plus there are a few club Extreme Enduros. There was the Foxborough Extreme at the end of last year. That was a good event. It’s not a big lap but its very physical for two hours, and I won that again for the fourth time. Then we were straight into the Valleys Extreme, which is another good event. It was really tough that last part, very steep and very tricky. But myself and two other lads helped each other out and we got to the finish. Then it was Tong, and then the Tough One, so it’s always busy in January for us Extreme Lads. What are the plans for this year then? Charlie: I’m going to be pretty busy, as I have committed to do the first four rounds of the WESS (World Enduro Super Series) series. I am going on a little trip with my friend Joe Westgarth from up north. We are taking his van and we leave at the beginning of May to Porto for the Extreme XL Legares, that’s the opening Wess round. Then we drive over to Trefle Lozrien in France the following weekend for a timecard, which is the second round of the WESS. Then there’s a two-week gap, and we are off to Erzberg. In between, we might do some riding in some places there. I have done Erzberg before, which is hard but enjoyable. Then the fourth round is two weeks after that in Italy and then we come home then. The month or so after that it’s Romaniacs, which is on the to-do list. To do the whole WESS series would be great but to do the lot it’s about a £30 grand job so we will have to see. Then I will give the Hawkstone round of the Wess a go and hopefully it will be a chance to get my points up in the championship. It all comes down to the budget so we will have to see what’s left after that. DH: Is there prize money to be earned in Extreme Enduro? Charlie: Yeah definitely. The bigger events like the Getzin Rodeo, there’s prize money there. There are certain events in the UK that offer prize money. There are championships here that are offering prize money. I know Steve Ireland at Wor Events has just done his presentation and he definitely went big with his prize money for the winners in every class. If you are doing club events it’s just a trophy or some bike wash or something but the bigger events there’s definitely prize money to be won. Back in 2015 I won the Tough 100 and won £500 which was pretty decent. The WESS series has really helped the profile of Extreme Enduro and the coverage has been exceptional. Even if you can’t make the event, people can watch it all back home. It is really good if people can’t make the events that they can watch it on their sofa and see what we do, and what we go through so they can get a feel for the sport. Now you are up into the Championship class of the British Extreme Enduro Champs, what are your goals for this year? Charlie: Not to finish last would be the main one. Coming up from the Expert class you are used to getting on the podium, whereas now, I have made that jump into the big boys class, but they are going so much quicker than what we are used to. You get a feel of what your pace is like, but then you jump into the Pro class and it’s a different league again. At Tong for the first round of the British, I got lapped twice by Jonny and Graham. It’s a different league altogether, you feel that you are still a good rider, then when you get in with those lads it’s a different class altogether. But that’s what they are training for, and what they are paid for, but its just something you have got to do. I remember my first Expert race. I used to be in Clubman and I made the jump to the Expert class, and I thought I might be in for a decent result here, and I did a Carl Tiley Hare and Hounds and I came 13th and got lapped twice by the first Expert rider. I was shocked as I thought how am I ever going to make up those few laps. How am I going to be as quick as them? Its just commitment, it’s just saying to yourself, you can do it, you can get better, you just have to stick with it. So many people I know have been and gone from the game as they come into it as a Clubman or Sportsman, and they ride, ride and ride and get better, then they go up to the next class, and they come 20th, and think how was I top three before, and now I am so far behind. You have to have the commitment, stick with it and train hard for it. But going up the next level will pull you on. You just need to latch on to them and stick with and don’t get too disheartened with it all. In the second part of our interview with Charlie we will be discussing what it takes to be an Extreme Enduro rider, what bike changes need to be made and how mentally tough you have to be to take on some of the toughest challenges you can face on a Dirt Bike.